Here at EzyMugs we know that ceramic mugs and cups aren’t always the best choice when looking for your next promotional mug. Our Express branded cup is made from BPA-free food grade polypropylene which means it is a great choice if you are promoting your brand to people who may use your mug when outdoors. 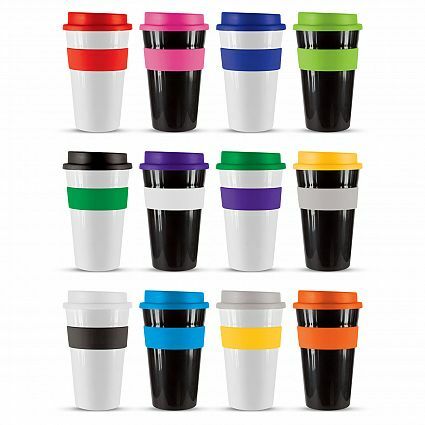 There are many companies now looking for reusable non-ceramic mugs, and with its heat resistant silicon band, screw on lid and being dishwasher safe, the Express cup is popular with many of our customers promoting their brand to campers, travellers, recreational sports participants and parents attending sporting events each week. Why? Because they won’t break and they look stylish – no one will know they aren’t ceramic. Apart from promotional giveaways, these mugs are great for promotional merchandise, and a good choice for fundraising opportunities for sporting groups – brand the cup with your club’s logo, and they are a great way to show off the support for your club come game day. The Express branded mug is also a great item to put into gift baskets at the end of the year for your best customers and clients, or to sell as a branded merchandise item in your café. Your clients and customers will love receiving a reusable mug that they don’t need to worry about breaking. The Express mug comes in two great sizes – 350ml and 480ml. Both give you great sizing for your logo print, and both sizes come in a range of colours to match your company branding or promotional campaign requirements. With 12 base colours, there are hundreds of different colour combinations you can choose from and each one will help your brand stand out from your competitors.